All ready for Christmas? Normally I would start with tree first, followed by other bits of decoration, but this year we started with… setting up the bar! This handsome bar cart was found lurking behind and underneath many other items at Old Mill Antiques one of my favourite places for hunting things I didn’t realise I needed yet. A quick clean and polish with the scratch cover of your choice (I prefer Mr Sheen) and it was revived. 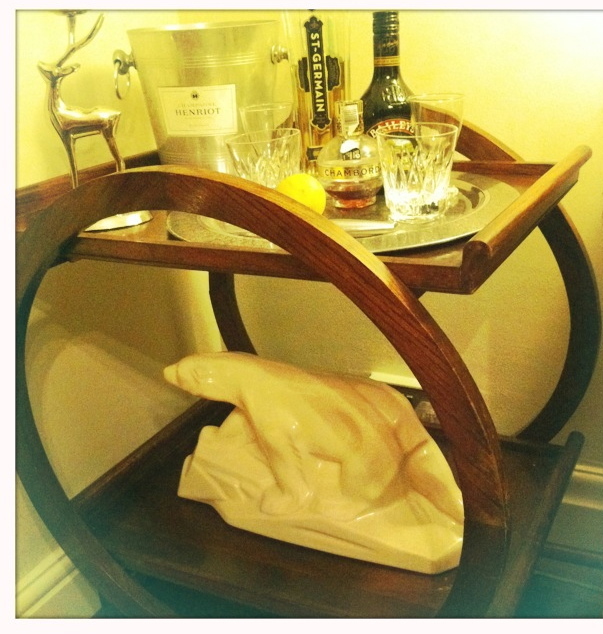 I think our faux Lemanceau polar bear sourced at a flea market in Brussels adds a certain je ne sais quoi, non? Next stop on the Christmas decoration list was blogdog in residence, Mr B! Please note no shorty Jack Russells were harmed in this blog post, possibly slightly annoyed, but not harmed and appeased with a dog cookie. was heaving and one of the staff gave me a top tip for next year. He pointed out that all the trees arrive from Norway at the same time, so avoid the crowds, buy early and keep it outside in a bucket of water until you’re ready to bring it indoors. I’m all about the real tree because I love the smell and bringing the woods inside your house – a faux tree just isn’t the same to me. Unless, I’m out of the country visiting my family in the US then I do have two fake mini trees that I substitute for a real one. Christmas trees are like coffee why have the instant stuff when you can have a real one? In our house the size of the tree is dictated by the height of the ceiling and I’m known for getting the biggest one I can find! Here she is…. 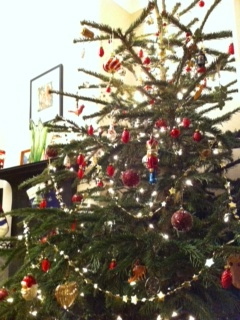 My least favourite part of the tree is doing the lights and the best bit is putting on all the ornaments. My collection of ornaments is a scrapbook of my life – some are gifts like by jump suited Elvis, some are souvenirs like my Annapolis, Maryland Christmas hatted and Christmas tree holding crab (as a cancer that one had to come home with me) and my Norwegian troll (a recent addition) and many are from my favourite ornament store TK Maxx! This year’s find at Home Sense (an all home ware TK Maxx – the type of store I dream about) is this fab red and white glass bauble..
You can also spot last year’s haul of small red glass pine cones in the background. 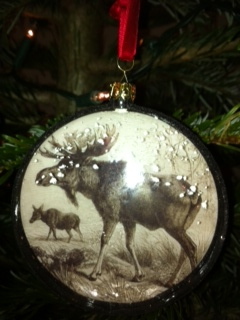 This year’s splurge was due to a visit to Liberty’s Christmas shop where I just had to get something. I’m not sure if he’s an elk or a moose, but he’s tartan on the back – amazing! He fits very well with the whole Scottish hunting lodge look I’m coveting at the moment. I’m convinced a tartan/tweed wingback chair is an essential new year purchase – if only I had some place to put it. 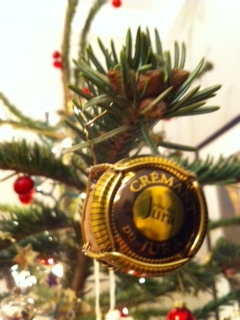 Champagne corks! Yes in the tree, with their little gold cages they look very Christmas-y. Do you have have the same problem that I do? I keep them for souvenir value and then they live in the kitchen junk drawer. I hope to create 1 or 2 more of these cork ornaments during the holidays – honestly I’m not drinking champagne I’m making decorations! I love that bar cart! This entry was posted on December 14, 2013 by The Sourcerist in Inspiration and tagged bar cart, Blogdog, Christmas, lemanceau, Libertys.